Unfortunately this beautiful chapel at Weybridge Cemetery Chapel wasn’t spared by the dreaded Dry Rot Fungus (Serpula lacrymans) spores, which germinated on damp roof timbers caused a leaking roof. It is likely the leak went unnoticed for some time, which were perfect conditions for the Dry Rot to grow and attack the base of the main roof structure timbers. This resulted in us having to carry out some very complex Dry-Rot restoration and treatment on behalf of our clients, Elmbridge Borough Council. Because this is not a ‘normal’ building structure and has a very complex, arched roof, great care had to be taken when removing and replacing the affected, weakened timbers Obviously an attack of True Dry Rot has no conscience, as not only did it attack this beautiful, holy buildings roof timbers, it was also spreading through the masonry, searching for more of its food source, timber. If left undetected the strands, which are called mycelium, can carrying on growing, often out of site behind plaster, until it causes mass destruction to other timbers and even greater cost to eradicate. Following instructions from Elmbridge Borough Council, a thorough survey was carried out by one of our Property Care Association (PCA) timber and damp surveyors who sourced the cause and extent of the attack and what restoration and treatment was required. Our clients were then issued with our detailed report, together with images of what to be done to eradicate it. 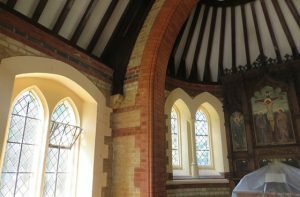 Following their further instructions, our trained and experienced operatives prepared the chapel, removing pews and fully supporting the roof timbers. The affected, weakened timbers were carefully cut out and the surrounding masonry prepared, prior to applying a fungicidal masonry solution at the approved rates. The timbers were then replaced and stained by our carpenter, to match exactly existing. The supports were removed and the pews refitted, to the delight of our happy client. We are the experts at carrying out Dry Rot restoration work, which is always completed to a very high standard and covered by our established 20 year guarantee and protected by Guarantee Protection Insurance (GPI). Tapco HomeDry has been trading continuously since 1971 and have carried out many Dry Rot restoration projects all over London and the Home Counties. We long term members of the Property Care Association (PCA), Trust Mark (Government Endorsed Standards) and an accredited Which? Trusted Trader with 5 stare reviews. There is only one way to eradicate Dry Rot properly and that is the right way. Compromise shouldn’t be considered so do it once, do it right, and call us first.